The nonfiction film “Wont You Be My Neighbor?” about the life and times of Fred Rogers, will be shown today through Sunday at the Gloria Theatre in downtown Urbana. Poster image provided by the GrandWorks Foundation. The Gloria Theatre is bringing this year’s highest grossing non-fiction title to the big screen this coming weekend with “Won’t You Be My Neighbor?” about the life and times of Fred Rogers. For more than 30 years, Fred Rogers, an unassuming minister, puppeteer, writer and producer, was beamed daily into homes across America. In his beloved television program, “Mister Rogers’ Neighborhood,” Fred Rogers and his cast of puppets and friends spoke directly to young children about some of life’s weightiest issues, in a simple, direct fashion. Rogers’ belief that a little kindness makes a world of difference resonated with audiences for decades and is doing so again with a new generation of filmgoers as this movie climbs the box office chart and expands into more theaters across the country. For the GrandWorks Foundation, which manages the theater, the film’s message complements the foundation’s mission to Reach, Restore and Revive the community. “What better way to revive our community than to share Fred Rogers’ legacy about the power of love, freely and unconditionally given,” said Staci Weller, executive director of the GrandWorks Foundation. When it debuted, there hadn’t been anything like Mister Rogers on television and there hasn’t been since. 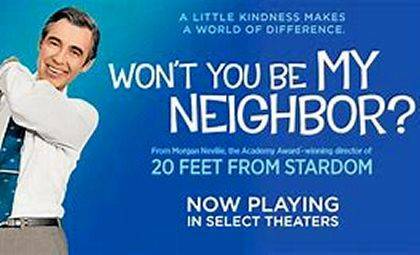 “Won’t You Be My Neighbor?” will play at the Gloria starting on Thursday, July 12, at 7:30 p.m. Other showings are on Friday, July 13, at 4:30 and 7:30 p.m.; Saturday, July 14, at 1:30, 4:30 and 7:30 p.m.; and Sunday, July 15, at 2:30 and 5:30 p.m.
For more information on upcoming events and showtimes, visit GloriaTheatre.org. https://www.urbanacitizen.com/wp-content/uploads/sites/36/2018/07/web1_PosterWeb.jpgThe nonfiction film “Wont You Be My Neighbor?” about the life and times of Fred Rogers, will be shown today through Sunday at the Gloria Theatre in downtown Urbana. Poster image provided by the GrandWorks Foundation. Submitted by the GrandWorks Foundation.